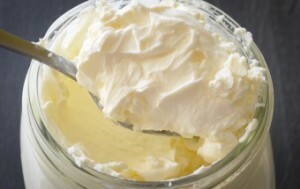 Homemade Crème Fraiche (pronounced crim fresh) is so easy to make! It’s a French term for fresh cream and is very versatile. Combine I pint of heavy whipping cream and 3 tbs of buttermilk. Cover with cheese cloth (to allow breathing of mixture to culture) and let stand at room temp for up to 24 hours or until thickened. Use as baked potato topping, on spicy hot foods or deserts. The longer it sits at room temp the sour and thicker it gets and the flavor improves dramatically. You can keep this in the refrigerator for up to two weeks. Feel free to experiment with different flavors by adding a little touch of different spices such as mustard seed, celery seed, pumpkin spice if you’re serving on a pumpkin pie, etc. You can also serve it on fresh strawberries and soups. Enjoy! 7 stitches? Smokey got himself into a tizzie! Cut oranges into quarters. Use a spoon to separate the orange and rind into two separate bowls. Julienne the orange peels. Put pulp in a cheese cloth and tie it up. Place the rinds in large pot, cover rinds with enough water to just above the rinds. Boil for about an hour and a half or until rinds are tender. Poor two cups of sugar in pot and 1/4 cup of lemon juice. Place the bag of orange pulp in pot with any orange juice. Cook for 15 minutes. Remove the bag and use a spatula to press any juice from the bag and place in large pot. If mixture does not thicken after another 15 minutes, just add two tablespoons of fruit pectin and cook for 5 minutes. Set the pot aside to cool down. Test for thickness every few minutes as the mixture cools down. Place in two 1 pint canning jars. Place the 2 jars into a large pot of water and boil for 15 minutes. Check the lids for vacuum. Lids should seal once the jars have cooled down. 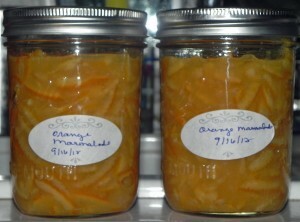 My first try at making Orange Marmalade!